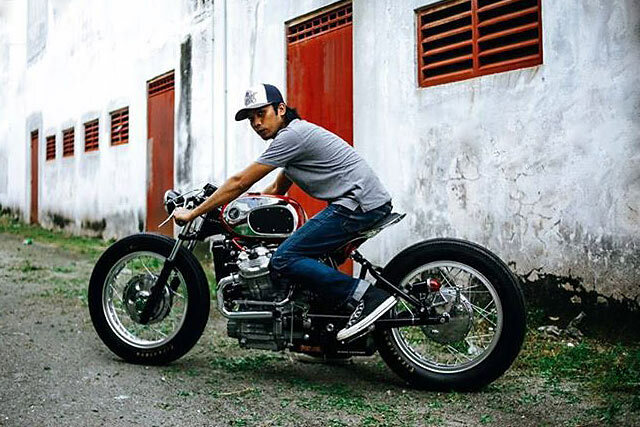 Once a small Malay village the city of Ipoh is now the thriving capital city of Perak state and it’s here that The Rusty Factory crew have forged their reputation. 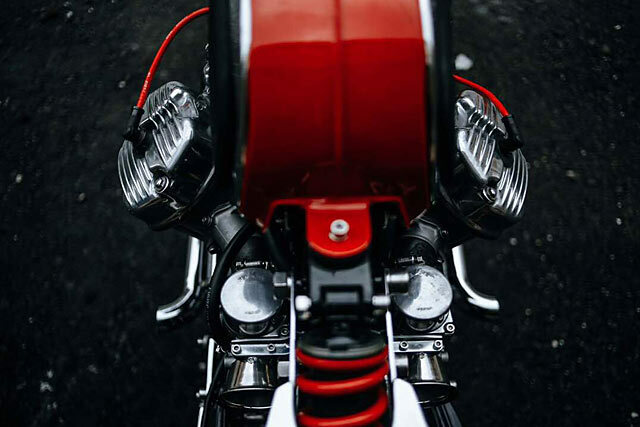 Focussing on small capacity machines their modus operandi is producing motorcycles that represent the personality of each customer while still being very practical to ride. 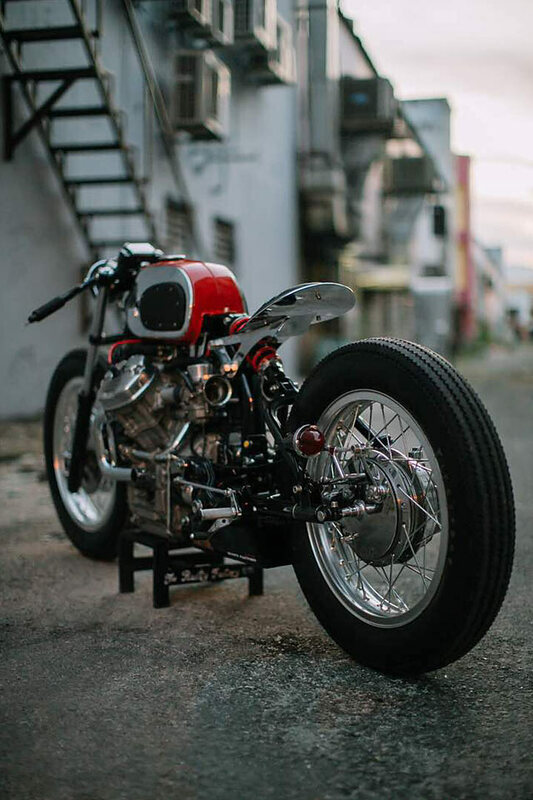 But when the invite came to be a featured builder at the Art of Speed show they turned to an old wreck in the corner of the workshop. Three years earlier they’d found the CX500 at a recycling facility, never having seen one before, because of its poor condition and their lack of knowledge about the Honda there it sat unloved. Until the idea was floated, if they were going to head into battle it was time to turn up the heat! 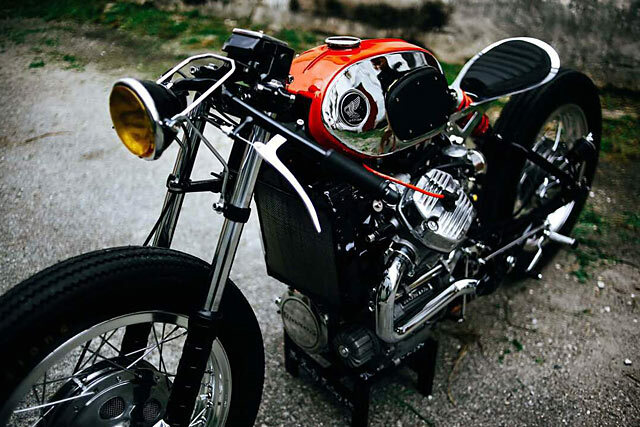 “We thought that building this bike would be a good idea and will give better competition to other builders,” says Mat. Because not only is the CX largely unknown to them and most of the Malaysian market, the crew had never built such a large capacity machine. 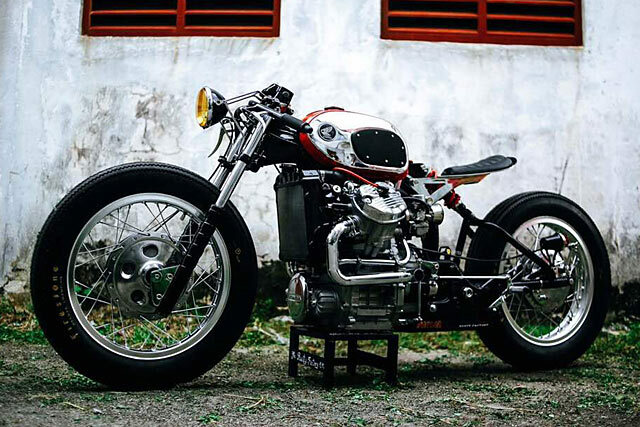 Let alone one with such an unconventional V-twin engine and drive-shaft combination. In fact they told us “I think you guys are much more expert about this bike than us.” Clearly that is no longer true, if only we learnt so fast! With the engine back in the frame, a little choke dialled in they hit the starter button and what happened next was their favourite part of the build “when the engine roars right after we finished overhauling it, we thank God.” From here what looks like tremendous effort for most was plain sailing for the team as they began the visual design around the revitalised V-Twin. 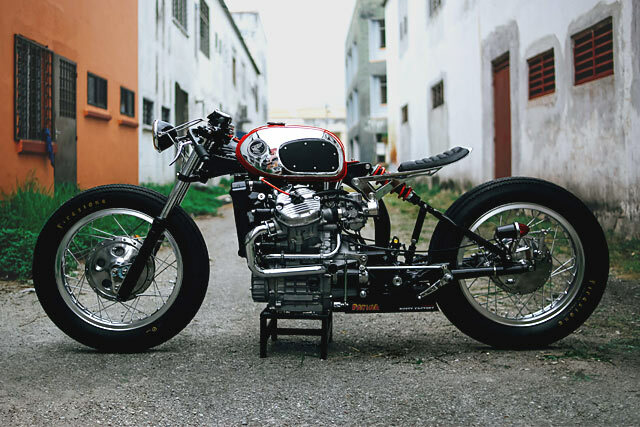 Looking at the CX500s that had previously been featured on Pipeburn they came to the conclusion that they wanted to ditch the twin shock rear end and possibly go for a hardtail conversion. In their compromise they’ve come up with an ingenious middle ground that includes a rigid look at the hub and the ride of a sprung rear end. The entire subframe, a bulky item on the CX, was cut back to the centre tube and a new design for the swingarm drawn up. 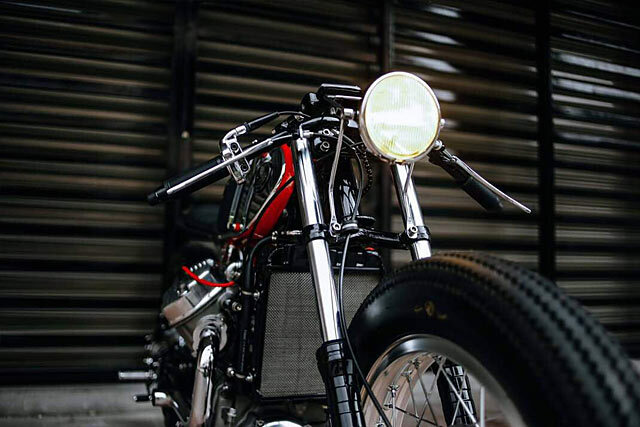 Rather than mounting the shock on the near base like most mono-shock conversions, they manufactured a triangulated swingarm using steel tube and an adjustable knuckle. This pushes the shock up under the seat where it protrudes through the seat base and mounts where the stock tank bracket used to call home, heavily modified for the application. 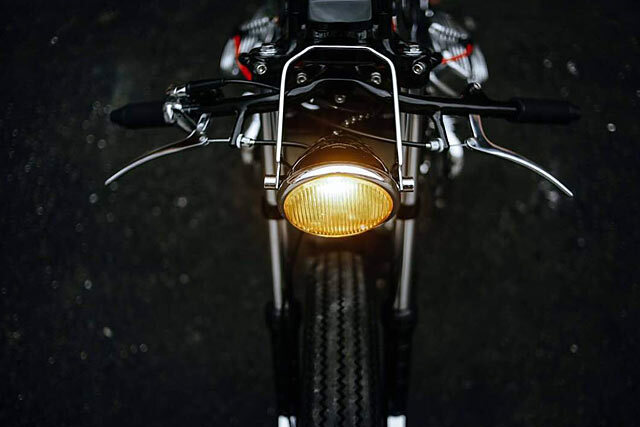 Having made such a radical transformation of the rear suspension leaving the standard front forks as they were was never going to be an option. With the new rear end bringing the overall ride height down considerably the front needed the same drop to level the bike. The solution comes in the form of brackets that extend the axle out further forward creating a long and low aggressive stance. The factory Comstar rims were ditched as The Rusty Factory was desperate to use spoked rims for the aesthetics. On the front end their fork conversion meant the change was relatively straight forward. But on the rear the standard shaft drive hub makes things more complicated. Rather than spend the money on a custom kit, a costly option once currency is converted, they came up with another brilliant scrap yard piece of engineering. Taking a Suzuki GS hub that once was shaft driven and sported spokes and adapting it to the CX input. 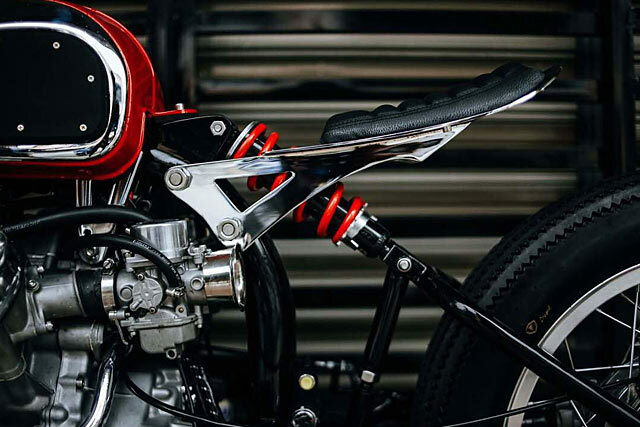 It might have been the most difficult part of the build but the chromed spoked rims wrapped in vintage Firestone rubber is the perfect match for the theme of the bike, giving it a real hot rod feel. While to operate the new rear brake and shifter the boys fabricated a full set of linkages to work with the custom set of rearsets. Now they could get down to the looks department, always mind full of wanting to show off the mechanical mastery of the build. With the donor bike coming without a tank and no stock replacement to be had they offered up an old Honda C200 unit and the look was spot on. New mounts were required front and rear as the C200 tank is literally half the size of the CX item, but it leaves the engine on full display. The seat and tail unit was adapted from ideas found online, extended to allow the shock to come through and then sent out to the chromer before being fitted with a neat hand stitched leather pad. With the bike now showing off its full personality the finishing touches could be added to suit. The pipes are handmade, running tight to the engine and venting out the flames to the side. The rebuilt carbies got a set of machined velocity stacks and the yellow lensed headlight sits on a custom bracket to push it out over the tyre. All of these pieces went out for chrome while the majority of the build was painted black. Getting the final colour was the last part of the build and took several attempts before the team was happy. But the Honda red works brilliantly, with the shock painted the same colour as the tank and even the spark leads colour matched. It’s easy to see why the owner immediately went for the name ‘Fire Ant’, the exoskeleton like chassis, red body and packing a hefty sting in the tail it was the perfect match. 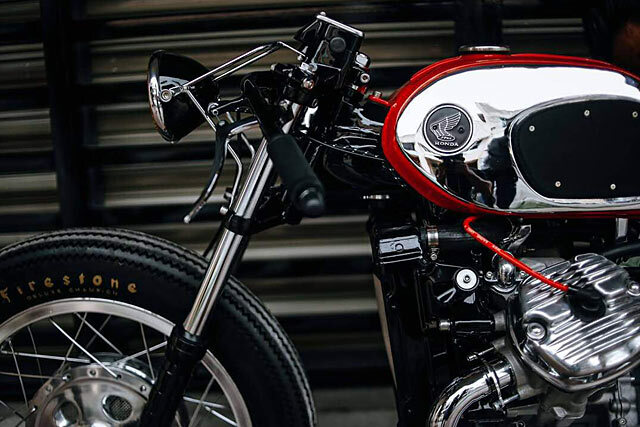 So how was The Rusty Factory’s first “big bike” received at the Art of Speed show? It was named Champion of the Invitational Build-Off, won the Public Choice Award and also took home the Pipeburn Pick trophy! An absolute home run for a team willing to take the risk of stepping outside their comfort zone and going for broke. It’s no surprise they now plan on “building more big cc bikes which will challenge us in many aspects. 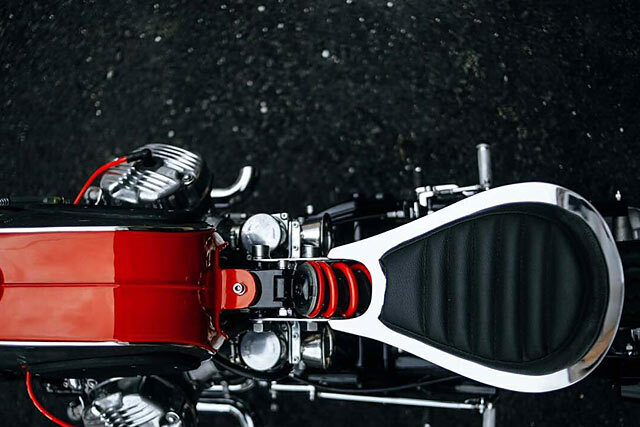 We dream of building bikes like Triumph, BMW and Harleys.” And we cannot wait to see the next finished results.